Aguilar introduces at NAMM 2015 a new solid-state Fuzz pedal for bass, the Fuzzistor. Electro-Harmonix is giving us the first taste of the new products that will be unveiled at NAMM with the Bass Soul Food. Aguilar will launch in November a new grindus bassus pedalus called Chorusaurus. The new pedal from Creation Audio Labs is a distortion designed specifically for bassists. 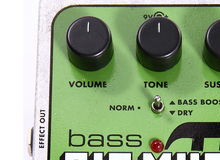 Along with the Deluxe version of the Big Muff Pi for guitar, Electro-Hamonix shrinks the effect for bass players.